Address: Avenida De Las Playas, 70, Puerto del Carmen (Lanzarote), Islas Canarias. Set next to Puerto del Carmen Beach, Apartamentos Cabrera overlooks the Atlantic Ocean, Isla de Lobos, Fuerteventura and the mountains. Its apartments feature free Wi-Fi and a balcony. Offering ocean views, Cabrera Apartments have simple, functional design. They all offer satellite TV and a safe. The kitchenette includes a kettle, microwave and fridge. 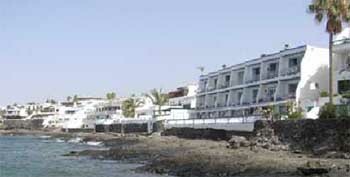 The Cabrera complex is just 50 metres from one of Lanzarote’s main streets, Avenida de las Playas. It offers a wide range of bars, restaurants and shops. Apartamentos Cabrera is next to Playa Grande Beach and Pocillos Beach. Lanzarote Golf Resort is 3 km away and Lanzarote Airport is within a 10-minute drive. Please inform Apartamentos Cabrera in advance of your expected arrival time. You can use the Special Requests box when booking, or contact the property directly with the contact details provided in your confirmation. This property will not accommodate hen, stag or similar parties. Guests are kindly requested to inform the hotel in advance of their estimated time of arrival. This can be noted in the Comments Box during booking or by contacting the hotel using the contact details found on the booking confirmation. American Express is not accepted as a method of payment.